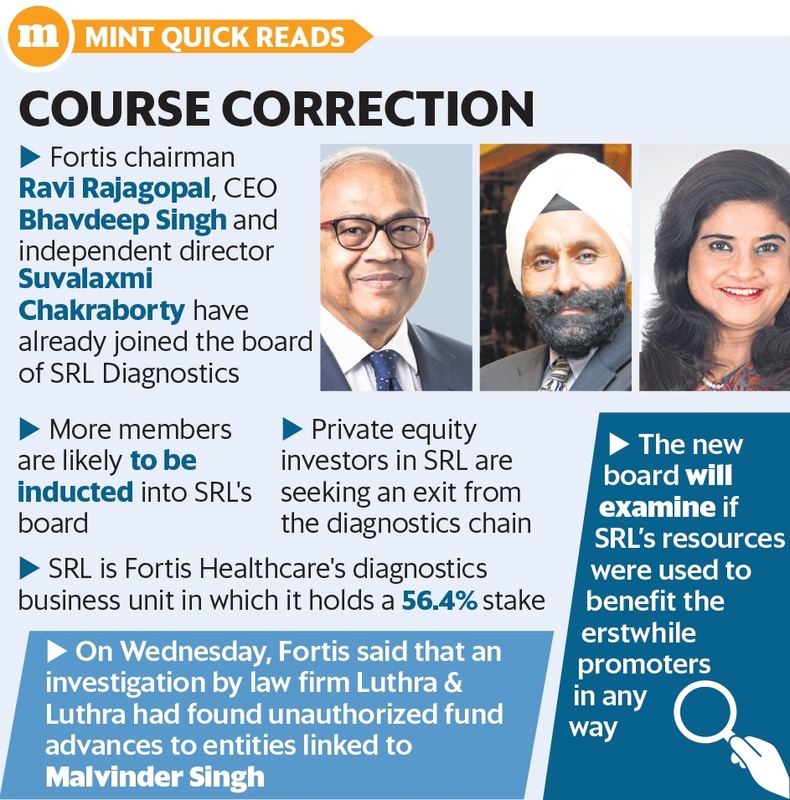 Mumbai: Fortis Healthcare Ltd is in the process of recasting the board of its unit SRL Diagnostics, having removed directors affiliated to Fortis founder and former executive chairman Malvinder Singh, who has been accused of misusing company funds. Former board members of Fortis including Brian Tempest, Harpal Singh, Tejinder Singh Shergill, Malvinder Singh and Shivinder Singh, who were also on the board of SRL Diagnostics, have quietly exited while Fortis chairman Ravi Rajagopal; chief executive officer Bhavdeep Singh; and independent director Suvalaxmi Chakraborty have already joined its board to meet the market regulator’s listing norms, two people familiar with the matter said on the condition of anonymity. “These members have resigned last month from the board of SRL,” said one of the two people. “More members will be inducted,” said the second person. On Wednesday, Fortis said that an investigation by law firm Luthra & Luthra found unauthorized fund advances to entities linked to Malvinder Singh. The hospital operator said it has initiated legal action to recover the outstanding loans. An email seeking comments sent to Fortis Healthcare, which owns 56% stake in SRL Diagnostics, remained unanswered until press time on Thursday. Fortis wants to make sure that SRL, which is the only cash-generating unit right now, stays free of controversy and yields maximum returns when it goes up for sale to offer an exit to the private equity investors, the second person cited above said. “It’s the obligation of Fortis to give them (private equity firms) an exit. It is a deal between the two shareholders. Management has nothing to do with that,” the first person added. The new board will also examine if SRL’s resources were utilized to benefit the erstwhile promoters in any manner, as had happened in the case of Fortis, these people said. Fortis Healthcare on Wednesday said that an investigation found that a Fortis unit had granted unsecured loans worth ₹445 crore to three companies affiliated to the Singh brothers without board approval and overruling objections from the management. Fortis said that “systematic lapses” and “override of controls” were also found in certain inter-corporate deposits that were used by the borrowers to grant or repay loans to entities whose directors were connected to the Singh brothers. The findings of the investigations have been submitted to the Securities and Exchange Board of India and the Serious Fraud Investigation Office, or SFIO.